The regular scripting trio:- Jim Zub, Mark Waid, Al Ewing. This time on colouring it's Marcio Menyz assisting Jay David Ramos. Conan's 1st adventure in Shadizar was in #6 of the original Conan The Brabarian series where he met a pair of thieves named Fafnir and Blackrat. And 2 of the people he and Wanda pass in the street here look suspiciously like that duo. He ran into the Night Cult in that city in that issue and in CTB#274. Nyx, Greek Goddess of Night, is seeking the 3 Night Shards of her soul in order to gain the power to take the universe back to primordial darkness. Voyager recruited a bunch of Avengers to stop her. So far the quest has all been for the 2 Shards whose location is known. Nyx gained 1 Shard in Omnipotence City but Scarlet Witch got it off her, and Voyager sent Witch and Shard through a portal to the Hyborian Age. Thieves stole the Shard from blind Wanda but she was rescued by Conan the Barbarian. Wanda tells Conan how Nyx can see through her eyes, so when they find the Shard he mustn't let her see it. Conan tells Wanda about his grim god Crom. Scarlet Witch charms some desert dwellers with her enchantments to give them a camel to replace the horse killed by a monster. The Barbarian uses his own methods to get others to tell them where the thieves' camp is. But when they get there the bandits are dead after fighting with red-robed men and a flock of crows. Conan recognises a symbol on a robed body as denoting a follower of the Night God, based in the city of Shadizar. So that's where they head next. Outside the city Conan says they must wait for night before entering stealthily - he's known and not welcome there. So they grab some sleep in the dusk and this time *he* has a nightmare vision through the eyes of Hawkeye of the dead body of Nyx' son Hypnos, and of Hulk holding the other Night Shard. Clint Barton and Rocket Raccoon have caught up with Hulk who snapped Hypnos' neck last issue to win the other Night Shard. They are in Nightmare's Realm, and now that Hypnos is no longer controlling sleepers Nightmare has his power back. Hawkeye tells Hulk not to do anything rash with the Shard, but Hulk snaps it open. He says he quite welcomes the idea of endless night and the end of humanity, which wouldn't bother him because he's immortal. Dreaming Conan reckons Hulk is a creature of Crom. But he wakes and accuses Wanda of invading his mind. She says she had the same vision, but it is because the blindness Nyx gave her also connects her to the Night Shards. They almost kiss but pull back. Wanda says she has someone else (Dr Voodoo). Conan says his heart is still with now-dead Bêlit. That night Scarlet Witch causes a mini-sandstorm to temporarily blind 2 guards while they slip through a gate into Shadizar. 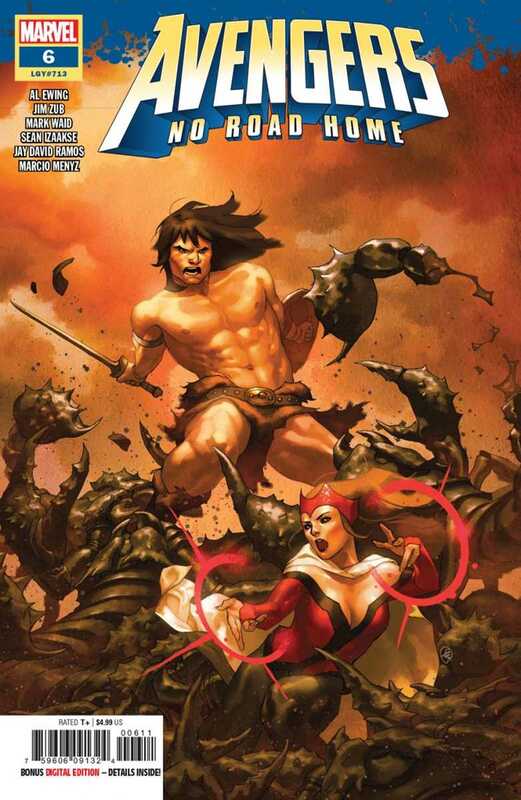 Conan leads them to a magic shop and asks for something to hide Wanda from Nyx' sight. The shopkeeper recommends an Adept's Cloak. During the haggling which ensues he mentions the Crow Cult who worship the Night God. Conan asks where these guys might be found. Conan gets the Cloak and the man tells him the magic is in the runes along the edge. So Conan rips the edging off and uses it as a blindfold around Wanda's (already-blind) eyes. The seller throws in directions to the Crow Cult temple for free. The duo sneak into the underground temple where they see crow-masked worshippers about to sacrifice the obligatory maiden by stabbing her with the Night Shard. The Barbarian charges in and kills the High Priest who drops the Shard. But as it falls it nicks the arm of the girl, and that drop of blood is enough to summon the giant talon of the Crow God. Conan chops off claws and bits of Cultists at random. The girl brings the Shard to Wanda, and as soon as she touches it a darkness from her eyes blasts apart the blindfold. The Crow God retreats and the remaining Cultists die as Nyx appears with her remaining 3 children and captive Voyager in the coils of Oizys.